If you were watching last night's game on FSN, you probably caught Craig Minervini interviewing the dude in the Houston Aeros jersey. We didn't have the sound on in the press box, but later, Craigervini told me the dude's story. 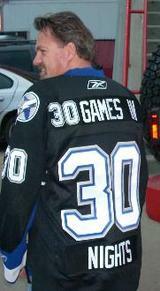 Name is Steve Williamson, and he's in the middle of a 30 games in 30 nights roadie. Going to see each NHL arena in a month. And I thought my traveling sucked. Tonight, Steve is in Ottawa to see the Senators play the Maple Leafs, then it's off to Pittsburgh. Here's what he said about his trip to Sunrise: A sparse crowd saw the game, and for the first time on my trip, the upper deck of an arena was almost completely empty. The building, like the Nationwide Arena in Columbus, is well-designed and welcoming, but without any of the unique touches that I've seen in other cities. A solid 7 out of 10, but without much atmosphere. AND: I'd never been in an Ikea store and was blown away by a) the size of the store, b) the low prices and c) how many people were in there on a Monday afternoon. They even have an overflow parking lot a couple miles away that they share with the BankCenter, but I imagine Ikea needs it more that the Panthers! Ha! I liked that line. Anyway, here's a link to his website and current blog. Enjoy.